When it comes to versatile roofing material, Asphalt Rolled Roofing is one of the cheapest. Mainly used for outbuildings like sheds, and garages, it is made with the same material as asphalt shingles. Some areas in the United Kingdom use it for residential dwellings, but it is not recommended. This is because it has a very limited life, and will need to be replaced a lot sooner than other types of roofing. Rolled roofing can also be used to help prevent leaks in association with other types of roofing. When it comes to roofing a garage or storage shed, it is important to make sure to do it properly to prevent leaks. Most people store important items that they no longer have room for out in the shed or garage. It can be heartbreaking to find childhood memories, and keepsakes drenched because of a leaky roof. Asphalt Rolled Roofing is an inexpensive way to roof outbuildings like a shed, if the roof is a low sloping roof. Another great use for Asphalt Rolled Roofing is for waterproofing underneath roofing shingles. It adds an extra layer of protection from leaks, and it help protect from wind. This is a great way to use this production on a residential house, that does not allow it to be used on its own. If apply rolled roofing it is important to use a good adhesive to make the product lasts longer. 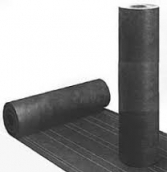 A common adhesive used with rolled roofing is called bitumen. Regular bitumen hardens during the colder months of winter, and begins to crack. If looking for a long term solution, there are modified bitumen solutions that do not harden as easy, and give the rolled roofing a longer life. No matter what building you decided to use Asphalt Rolled Roofing on, without proper installation it will not do you any good. This roofing is an easy do it yourself project, but make sure you know how to install it properly. If you are not sure on the process, ask an expert at the local home improvement store, or hire a professional to install it for you.